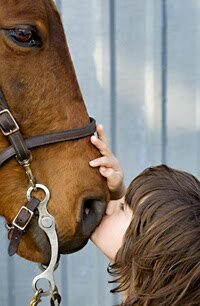 I would like to try horse therapy with my autisic son but there is one problem...he freaks out whenever animals get near him. He thinks they smell too much and their feel/noises etc flip him out. Being creative with autism is definetly the way to go! I recently saw this show on a local PBS station and was inspired. I was diagnosed with Aspergers Syndrome when i was still a young child and have since gone through a bunch of other life changing ( some good and some really bad ) experiences. Most of the bad ones had taken place because of my own decisions and the wanting to fit into society and forgetting that I didn't have to really make myself fit, that i was who i am. And that i am ok with that now. I tried with no success to do things the wrong way. I escaped into my own little world far past what most austistic kids i think go, and now I am working on learning about myself and gaining back the relationships I had in the past that were a good influence on me rather than sticking with people who tended to create bad experiences around me. I am looking into working possibly in much of the same capacity as that of places where they take people with special needs, hopefully an autistic needs school where I can share my life with others and help those with my experience.